The Violet Fire is a high-frequency violet light that, when directed by consciousness, transmutes negative (downward spiraling) energy through Christed consciousness in the atmosphere. 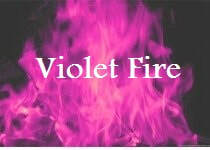 The Violet Fire can be created from the 3-fold flame that lives within the heart of your human Spiritual self. peace and justice and the gold flame of wisdom. the Violet Fire is created. To use the Violet Fire, one simply directs it visually and verbally to fill every atom and molecule of one's being, through all seven bodies, on all levels and dimensions, into the past, future and present. As energy must be guided and directed, or 'told what to do', the Violet Fire is told to "transmute all limitation within the consciousness", being very specific about what it is you are transmuting. Just having a 'mental ah-ha' is not usually enough to shift this influence on your reality. This is when you use Violet Fire. All limitations about ___________ 3x." was once your truth but no longer serves you. "White Fire fill me now 3x. Filling me with new possibilities and new realities. 3x"
At this point you can choose to visualize, speak, and/or feel your new truth, or simply let yourself be unlimited. gratitude. And so it is." When done properly, this process will leave a person feeling lighter, brighter, freer and obviously shifted away from their previous issue, which may not even be remembered. There will be no emotional charge regarding the issue, and there may even be a mental absence of whatever it was that was limiting you. This frequency is used to free yourself from unwanted thought patterns and painful memories that continually draw unwanted experiences. Once only taught in the retreats of the Masters or discovered through personal meditation, this knowledge and science has been released to the outer world by Saint Germain in the 1930s through his I AM movement and in the 1950s through the world's most tested trance phenomena adept, Keith Milton Rhinehart, through the Aquarian Foundation headquartered in Seattle, Washington. Called the Man of A Thousand Faces, the Man Who Never Died, and the Wandering Jew of the Bible, this portrait of Count St. Germain (Comte de Saint Germain, Comte Saint-Germain,The Count of St. Germain) was done at the West Coast ashram of Paramahansa Yogananda, where The Count materialized to sit for the portrait. Portrait courtesy of Janice Simmons.